LA JOLLA — (Feb. 14, 2018) We count on firefighters to protect us in life-threatening situations. So it's in everyone's best interest for them to be healthy and fit. Salk Institute and University of California San Diego School of Medicine researchers have been awarded a $1.5 million grant by the Department of Homeland Security for a three-year study to see whether restricting food intake to a 10-hour window can improve firefighters' well-being. 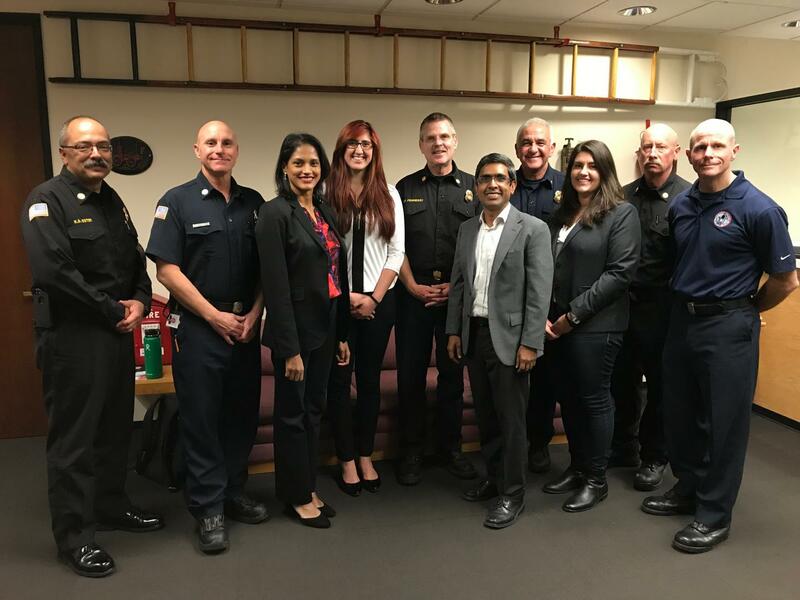 "Firefighters seem invincible to us, but they are actually at high risk for many chronic diseases because of how shift work disrupts the body's natural rhythms," says Satchidananda Panda, a professor in Salk's Regulatory Biology Laboratory and co-principal investigator of the new study. "We want to understand if we can counter some of the disruption with simple changes not only to what firefighters eat but also when they eat." For most of human evolutionary history, daylight and access to food were limited. So almost every cell in our body has a biological clock that tells it when to be active — using the nutrients from food to grow and conduct normal business–and when to rest. These 24-hour clocks produce circadian (daily) rhythms in almost every aspect of physiology and behavior. Increasing evidence is showing that disruptions to this natural cycle caused by the modern lifestyle, with its artificial light and round-the-clock access to food, can impact our health, resulting in everything from poor-quality sleep to obesity, heart disease, diabetes and cancer. Panda, whose laboratory studies the molecular bases of circadian timekeeping in mammals, previously found that restricting the access of lab mice to food for 8-10 hours a day resulted in slimmer, healthier animals compared to mice that ate the same number of calories around the clock. Preliminary studies in humans suggest similar health benefits of such "time-restricted eating," which does not change the quality or quantity of food, just the time period in which it is consumed. Because firefighters are at higher risk of developing cardiovascular diseases than the general public, Panda and collaborating co-principal investigator Pam Taub, MD, associate professor of medicine at UC San Diego School of Medicine, plan to use the grant to test the effectiveness of a circadian-rhythm-based diet intervention compared to standard nutritional behavioral counseling on firefighters' cardiovascular health. "Shift workers, like firefighters, are a critical part of our community's well-being and we need to identify strategies to improve their overall cardiovascular health. We believe that a simple lifestyle intervention, such as time-restricted eating, can prevent or help reverse cardiovascular diseases, such as high blood pressure, diabetes and coronary artery disease," says Taub, cardiologist and director of the Step Family Cardiovascular and Rehabilitation Center at UC San Diego Health. "The goal of our study is to better understand how giving the body a 'metabolic rest' by limiting the amount of time food is consumed can improve important parameters for health such as weight, blood glucose levels and cholesterol." "The wellness of our employees is our top priority," says San Diego Fire-Rescue Chief Brian Fennessy. "We are hopeful this study will give our members information they can apply to their lives, which will reduce the incidence of chronic disease that firefighters are prone to." The study will be closely watched by the National Fire Protection Association, which is interested in extending any beneficial results to other fire departments. And because nearly 20 percent of Americans are shift workers with nonstandard hours of activity and rest, the study results may also prove applicable to these individuals and their family members, who can likewise be substantially impacted by a shift worker's schedule. "We are very excited about this study, which embodies a collaborative model for biomedical research in which landmark discoveries from a premier basic science institute are tested in a real-world situation through a world-class medical research entity," says Panda. "It's a win-win-win."